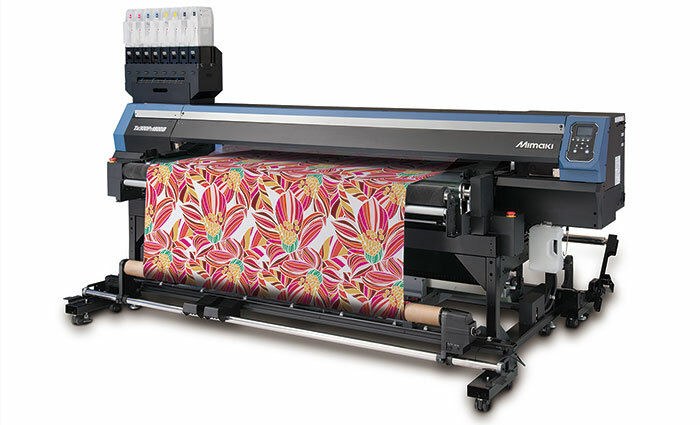 Mimaki today announced that its Tx300P-1800 and Tx300P-1800B direct-to-textile printers have been updated to simultaneously load both textile pigment and sublimation dye inks. This enables the use of a single printer to print directly on a wide range of textiles without the need to change out ink systems. This new technology, that wasn’t possible until now, is a breakthrough that will improve productivity and increase flexibility for these Mimaki textile printers. Mimaki offers five different ink types for textile printing, including sublimation dye ink, dispersion dye ink, textile pigment ink, reactive dye ink and acid dye ink. In the normal course of operation, one ink per printer must be selected. But now textile producers will be able to use the two most popular ink types in one single printer. The Tx300P-1800 and Tx300P-1800B direct-to-textile printers will be able to simultaneously load TP400 textile pigment ink for cotton and hemp materials as well as Sb420 sublimation dye ink for polyester material. Since neither ink type generally requires steaming or washing in the post-treatment process, there is no need for a large space, a huge quantity of water, or special expertise in handling the printed fabric. All that is required is the printer and colour fixing equipment, making these entry-level printers suitable for use by designers, fabric workshops, and educational and research institutions. With textile pigment ink TP400, large post-treatment equipment is not required. These inks, which consist of solvent, pigment and binder agent, are fixed through heat without impairing the breathability and water absorbency of the fabric. The result is beautiful printing on cotton and hemp materials and is recommended for interior fabrics, T-shirts and various other apparel applications. Sublimation dye ink Sb420 is specifically designed for use with pre-treated fabrics, especially polyester. The colour is fixed using heat after printing. Printing on polyester with these inks delivers excellent colour accuracy and reproducibility. The Tx300P-1800 printer can print directly onto almost any type of natural or man-made fabric and is ideally suited for thick and woven textiles. Its combination of an affordable price, speed and high quality make it perfect for producing short runs or samples of customised and other designs. The Tx300P-1800B printer uses an innovative automated belt-fed conveyance system that is particularly effective when printing on modern stretchable materials. It prints to a broad range of natural and man-made fabrics and is ideal for the production of fashion, clothing and soft furnishing materials. The hybrid ink system for the Tx300P-1800 and Tx300P-1800B direct-to-textile printers will be commercially available in the summer of 2017.